Is your basic knowledge of aviation limited and want to learn more? Have you ever wondered what the local flight procedures are where you live? If your interested in finding out more, you can simply teach yourself by using free aviation resources for aviation enthusiasts. Take a look at the official FAA downloadable resources. All the US aviation visual navigation charts are available to download at no cost. You can search for NOTAMs (Notices to Airmen) for your local airport – even written in non-aviation terminology. 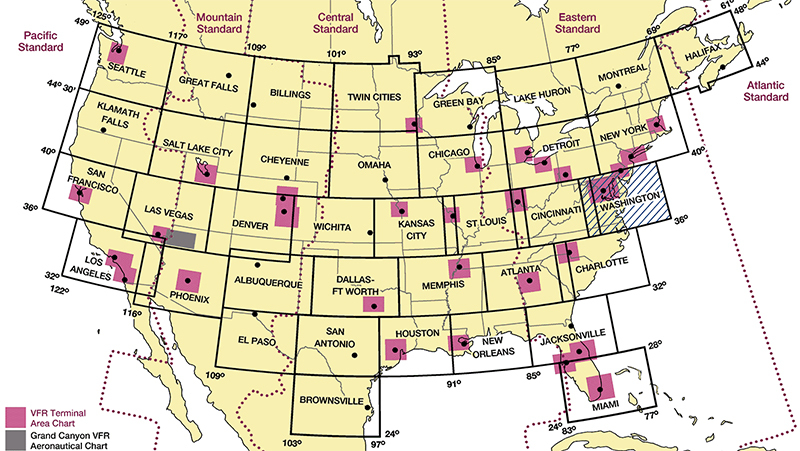 Monitor Temporary Flight Restrictions (TFRs) across the United States. Check the latest aviation weather forecasts for your airport or your destination and so much more. For someone who is not a pilot, but finds aviation fascinating, you will probably find the US aviation visual navigation charts the most interesting. The visual navigation charts, or Sectional Charts as they are called, contain a wealth of valuable information. Depending on where you live in the US, there are 39 different sectional charts to choose from. This includes the lower 48 states, Hawaii, Alaska, Puerto Rico and parts of Canada. Take a look at the overall map above to determine which sectional chart you want to download. From there, find the appropriate PDF to download for your area. The PDF file sizes are large, but the amount of information available on the chart is incredible. If in doubt as to what the symbols and colors mean, look at the key located on the side. These are official maps, so if you are using any of these maps for flight planning purposes; please make sure the map is valid for the time and date of your flight. Each sectional chart contains information such as controlled and uncontrolled airspace dimensions, radio frequencies, obstacles, airport information, ground based electronic navigation aids, federal airways, terrain, rivers, highways and so much more. You will be amazed about the information you will find. Most people will probably find the sectional chart for their area quite interesting. I’m certain amateur radio operators will especially find the radio communications information interesting. 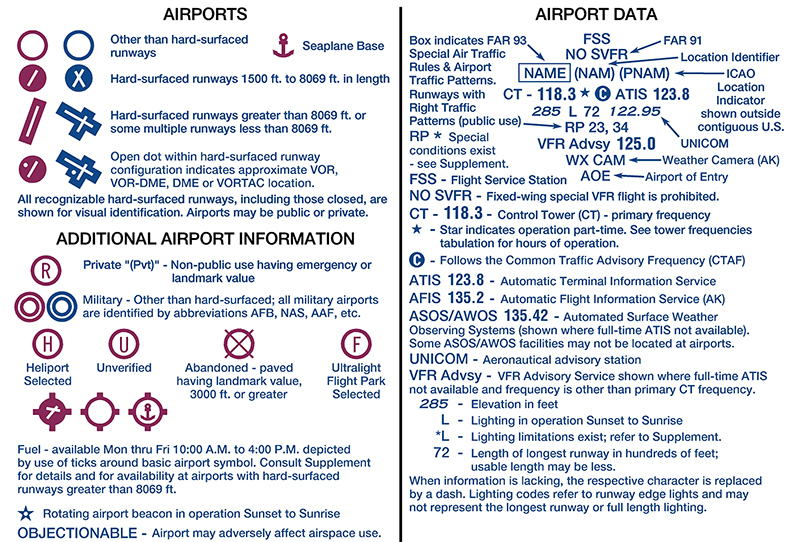 The Terminal Charts are for larger cities with Class B airspace. Think of Class B airspace as “busy” airspace. NOTAMs or Notices To Airmen, are up to date temporary operational changes that have taken place, but are not necessarily marked on a map or on any kind of official publication. The operational information can vary; from temporary taxiways closures through to an airport closed to all aircraft. Either way, the NOTAMs need to be checked by pilots before each flight. Depending on where they are flying will determine which NOTAMs they are going to look at for the flight. NOTAMs can vary from one day to the next, so they need to be checked daily. This link will enable you to find NOTAMs for a specific airport. Type in the city or city code. (If your unsure of your local airport city code, search online. Not all city codes are immediately obvious.) If you see a NOTAM you wish to read, click on the specific NOTAM, and you’ll have the option of reading it in “Plain English”. Click on the “Plain English” tab above the NOTAM. Temporary Flight Restrictions (TFRs) are just that, temporary flight restrictions or temporary restricted airspace. Most Temporary Flight Restrictions are placed over an area such as a wild fire where aircraft are fighting fires, etc. Or maybe a public event, such as the Red Bull Air race. They are places where no one needs to fly unless they are part of an operation dealing with why there is a TFR in the first place. Most Temporary Flight Restrictions are not large areas, usually only a few miles wide and a few thousand feet high. Usually there are not many TFRs across the nation at any one time, so they tend not to effect many flights. The main exception being the Air Defense Identification Zone (ADIZ) area surrounding the Washington DC area. The Washington DC area is an exception to the rule; which there are special procedures in place for aircraft to fly in and out of. An important part of any flight briefing is the weather. As pilots, we cannot use any old weather forecasting app to determine if the weather will be okay at our destination. We need to use official sources, such as Aviation Weather. Click on the TAFs button. TAFs stands for Terminal Aerodrome Forecast, a forecast for a specific airport. METARs are weather reports, meaning a report of the actual weather conditions at a specific airport. All airports with a control tower will have a weather forecast and weather reports. Once you search for a specific TAF or METAR, you can click on the “decode” button to read it in plain English. There are also plenty of tutorials on youtube explaining how to interpret TAFs and METARs. If you are wanting to get involved in aviation, you’re an enthusiast or flight simmer, these links are useful to get you started. Various Practical Test Standards (PTS) – Private, Commercial and Airline Transport Pilot. Don’t let the name ‘handbook’ fool you, some of these books are large manuals and quite detailed. If any of the clickable FAA links to publications no longer work, simply search for “FAA” and “the book title”. Each of these manuals are free to download at no cost from the official FAA website. If there is one thing I have learned in life and aviation; The Learning Never Ends. I wish you well and enjoyment building on your aviation knowledge and experience.